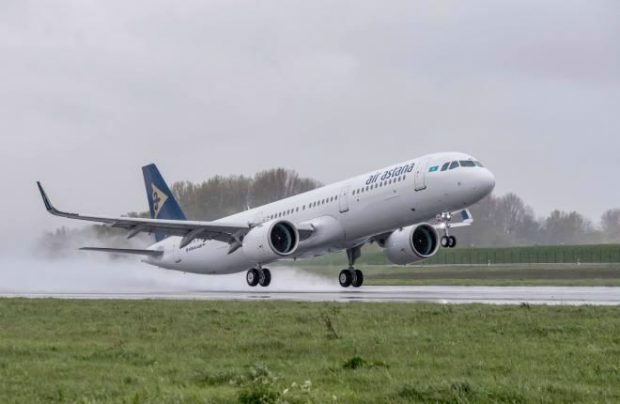 Kazakhstan’s flag carrier Air Astana has taken delivery of its first Airbus A321neo. The airline is the launch operator for the type in the CIS. The Pratt & Whitney PW1100G-JM-powered aircraft made its first revenue flight from Astana to Almaty on January 3. The airliner was handed over to the customer at Airbus’s Hamburg assembly factory. The operational lease agreement with AerCp covers a total of three A321neos and a single Airbus A320neo. The new aircraft seats 28 passengers in business class and 151 in economy. The cabin is equipped with individual monitors and an IFE system. The Kazakh airline had its first A320neo delivered in late 2016; like the new deliveries, the airliner is powered by Pratt & Whitney engines. Air Astana expects to have 17 A320s by 2020: six A320neos, seven A321neos, and four A321neo LRs. Another CIS operator with A320neo family aircraft on order is Russia’s S7 Airlines. It currently operates four A320neos, and expects to start operating A321neos this year. These new airliners will also come with Pratt and Whitney engines. Airbus says S7 expects to acquire up to 30 aircraft of the neo family. Ural Airlines has also reportedly negotiated purchase of the largest aircraft in the A320neo family.